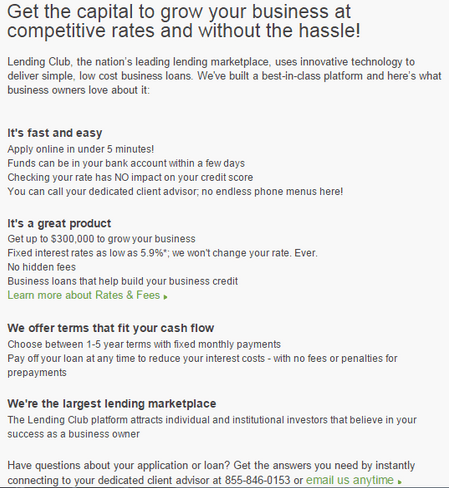 Yes, I know LendingClub is primarily a consumer lender. Yes, I know LendingClub isn’t really a consumer lender, but a matchmaker. Yes, I know LendingClub isn’t really a matchmaker, but is a high-growth Internet company — at least that is what the bankers pushing the IPO want you to believe. The advantage is to be priced along the likes of Twitter and LinkedIn, not Bank of America. That’s 39 times last year’s sales versus a BAC valuation of two times sales. LendingClub’s model uses the Internet to match investors, or lenders, with borrowers — peer to peer lending. The company is different from the short-term daily debit lenders, typically lending money one to five years with interest rates similar to moderately priced credit cards — 12% to 25%. So, what has this to do with small business brick and mortar lenders? Should small business brick and mortar lenders be concerned with a consumer lender with an average loan size of less than $15,000. As LendingClub, and other alternative lenders become comfortable with managing risk these companies will naturally move into the lucrative small business lending world. Check out this marketing copy for a small business loan from their website. A question for the C-suite. Will these alternative lenders replace your business acquisition infrastructure, and then you become the investor? Mull that one over….